Vrchlabí is a small town in the north east of the Czech Republic in the roots of the Krkonoše Mountains. 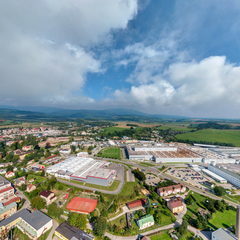 Vrchlabí was established probably in 13th century, in 15th and 16th centuries, Vrchlabí saw a rapid development of mining, metallurgy and ironworks. After the Thirty Years War, the textile manufacturing started to grow.Since the mid-17th century Vrchlabí became known for organ making by the Tauchman family. Despite its rich history, Vrchlabí lives very much in the present. Vrchlabí has today approximately 13 thousands of inhabitants and from the DSO’s point of view there isnearly 5000 of supply points. The technological development of Vrchlabí includes the CEZ Group’s smart grid project called Smart Region. What is “smart grid”? 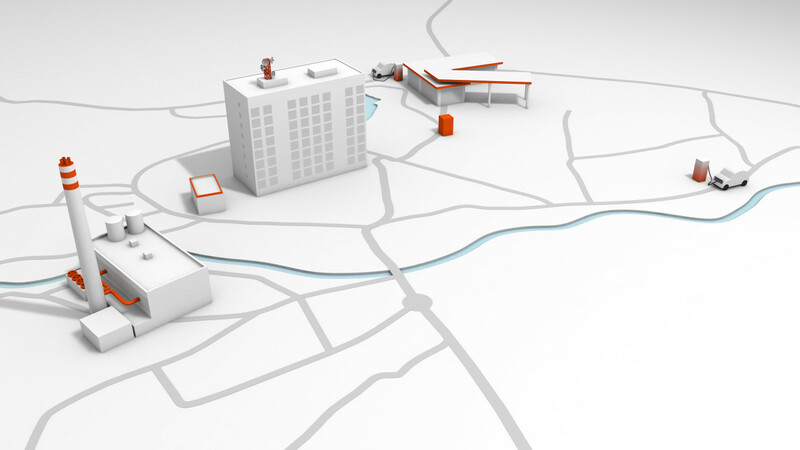 A vision of the smart grid concept presents reliable, automated and efficient control of distribution network. It is based on interactive two-way communication between electricity generation sources and customers via distribution network equipment to match the actual needs of energy generation and consumption. How does it work? Within the Smart Region project, CEZ Group implements up-to-date technologies in the distribution network, tests the operation of intelligent electricity meters including interactive involvement of customers, uses IT technologies to support control of the network, uses local combined heat and power (CHP) generation (cogeneration) and tests electromobility. Why here? Vrchlabí was chosen because its size is well suited for the purpose of the demonstration project, there are integrable renewable power sources and a potential for building several combined heat and power generation plants. Moreover, Vrchlabí being situated near the Krkonoše Mountains National Park is an ideal location with regards to environmental benefits of the Smart Region project. Last but not the least the project can be implemented thanks to the support and goodwill of the municipality. The vicinity of the Krkonoše, the highest Czech mountains, is evident everywhere in Vrchlabí and it is even more impressive from the aerial view. The nearest peak is Přední Žalý (1 018 m) oriented towards the northwest, with the oldest view tower in the Krkonoše, it was put up in1892. Most of the fascinating views, unfolds at east, where the silhouette of Černá hora (1 299 m) rises up in the forefront, with the television transmitter on its top. From there we follow a trail along the mountain ridges over Hrnčířské boudy, Liščí hora (1 363 m) and Na Rozcestí (1 344 m) - a cult place with a chalet. From the north we move back to Vrchlabí along the mountain ridge trail via chalets Zadní and Přední Rennerovky and Lahrovy boudy. To the west, we look over the river Jizera valley towards Jilemnice and Semily. Southward, the terrain slowly descends to the Krkonoše foothill area near Nová and Stará Paka, around the ruins of the castle Pecka and town Hostinné. Fifteen kilometres away, beyond the horizon, in the clouds, we can behold a border ridge of the Krkonoše, with Sněžka (1 603 m.), the highest mountain in the country. On its Czech side, we can see a new cableway and building of Česká Poštovna (post office). The operation of these technological amenities for tourists including back-up power supply for buildings on the Polish side of the mountain is provided by the highest located MV/LV substation in the Czech Republic that is part of ČEZ Distribuce network. The word "cogeneration" abbreviates the combined heat and power generation. The cogeneration unit consists of a power generator which is usually driven by a combustion engine propelled by natural gas, and sometimes also by gas or steam turbine. Unlike the traditional power plants, where the heat produced during power generation is usually not effectively used, the heat from cogeneration is used effectively within the local heating system, thus the CHP saves both the fuel and financial resources necessary for its purchase. It is obvious that cogeneration is a modern ecological facility which reaches almost 90% efficiency of the primary fuel use. More about cogeneration within CEZ Group. 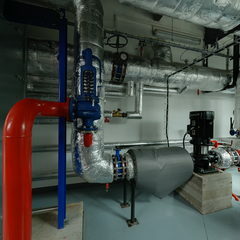 Cogeneration unit in the boiler room at Žižkova street in Vrchlabí generates heat and power from natural gas for hundreds of residents at the district called Liščí Kopec. 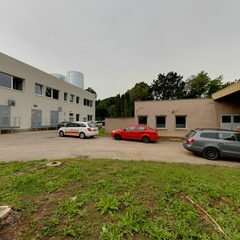 Within Vrchlabí, there are altogether three CHPs, two are placed at Žižkova street and one in the area of a factory NKT cables. One of the CHPs at Žižkova street is used directly within Smart Region project in so called island operation demonstration. See an island operation diagram. The output from the cogeneration unit is transmitted via the transformer to the distribution network. The output of the transformer is 2 MVA and it transforms voltage from 0.4 kV to 35 kV. Within Vrchlabí, there are all together three CHPs, two are placed at Žižkova street in and one in the area of a factory NKT cables. 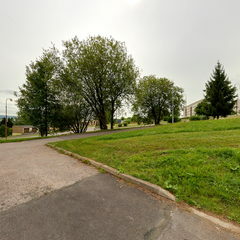 One of the CHPs at Žižkova street is used directly within Smart Region project in so called island operation demonstration. Both cogeneration units at Žižkova street are connected to the distribution system. Thermal energy is distributed via hot-water pipeline. The aboveground part of the hot-waterline is used for placement of MV cables laid in protective tubes. The control room provides control and monitoring of the cogeneration facility technology. The operator monitors both cogeneration units, their parameters and other technological equipment. Storage tanks serve as reservoirs for hot water. 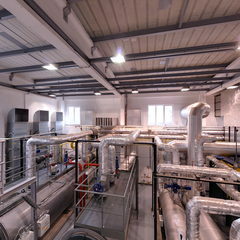 Each cogeneration unit uses one tank with capacity 150 m3. In the cogeneration facility there are installed two gas boilers 3,5 MWt and 2,8 MWt and two cogeneration units of the same capacity 1 560 kWe of electrical output and 1 791 kWt of thermal output. Part of each cogeneration unit is a flue gas heat exchanger used to transmit heat to water and hence increase the overall efficiency of the CHP unit. Two hot-water storage tanks each of 150 m3 capacity are also part of the facility. The operating cycle of a cogeneration unit includes cooling. The heat from cooling is distributed to customers, excess heat is taken to the hot-water storage tanks and it is used later. The temperature of water in the tanks is 90°C. Hot-water storage tanks are used to balance the disproportions between the heat generation and consumption. The cogeneration facility provides heat for residents, connected industrial sites and the city administrative buildings. The electrical energy output is sufficient to supply majority of Vrchlabí. To maintain the balance of the power consumption and generation during the island operation, there are installed six electric boilers, each with capacity 36 kW. This additional load is used to stabilize the source operation. Additional load of 100 kW, out of the 216 kW, will be connected during the island operation. This will allow the elimination of abrupt changes of power consumption within a range of ± 100 kW, while preventing interruptions of power supply for customers. Balance automatics of island operation–is a piece of equipment delivered by one of project partners - a company called EGE. The aim of the automatics is to balance the whole island operation, i.e. a situation when a part of Vrchlabí is disconnected from the HV network. The transition to the island operation mode will not affect the continuity of power supplies and thus the end customers. This pilot project is unique in its scope even on a European scale. It provides both a power source and back-up power supply in case of failure on HV network. The generation only depends on natural gas supply. The heart of a cogeneration unit is a set of 16-cylinder motor with a generator. A turbo engine drives the generator with an electric output 1 560 kWe The driving fuel is natural gas with a consumption of approx. 380 m3 / h. Capacity is 71 dm3. Technological coolers are installed to re-cool the combustion mixture. 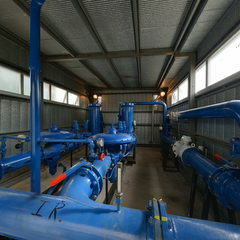 Consists of circulation pumps for hot-water distribution, a 4 MWt heat exchanger and a hot-water treatment plant. A back-up 16 kWe diesel generator is installed on the site to secure the start-up of a cogeneration unit in case of failure on HV network during the hours when the CHP is not in the operation (black start). 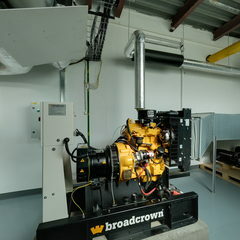 The start of a diesel generator is controlled by the cogeneration unit control system. It regulates natural gas which enters at 300 kPa medium pressure and is reduced to 42 kPa. One line of the regulation station is operational; the other is back-up. The stations have their own invoicing measurement of gas consumption. Given the complex functionality of the turbo engine, each unit has its technology cooler for after-cooling the fuel. Emergency coolers are prepared for use in situations when power is supplied during the island operation mode even at the time when there is no demand for heat. 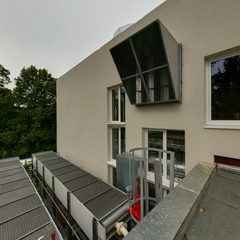 The smokestack, originally 80 m and now 40 m high, is lined with stainless steel liners and it serves for smoke fluefrom the CHP and boilers smoke. In Vrchlabí all DTS are remote controlled, and six of them are "disconnection" type. ´Disconnection DTS are used for fast isolation of part of the distribution network affected by failure. Communication within the disconnection DTS is secured via fibre optic cables, the other DTS are remote controlled via Wi-MAX. All of them are used for automation of MV network and two of the mal so for automation on LV network. DTS are fully reconstructed and equipped with new technology which is remotely controlled from the control centre. Fibre optic cables were placed along with MV cable replacement. Fibre optic cables are used to provide reliable and fast communication. Here the control and communication technology is installed. ICT equipment in an AXV cabinet provides communication services within DTS with a connection to the corporate data network (switch, optic switchboard). DSO equipment (RTU ABB, router, switch) provides the communication of MV elements. Equipment supplied by the Ormazabal Current and MEgA companies is installed for the measurement of power quality. Measured values are transmitted to data repositories for further use. In case of power failure it is possible to operate the equipment for approximately two hours due to the back-up source in the ATQ cabinet. On the left are LV switchboards equipped with remote controlled circuit breakers instead of the standardly used fuse switches. The connection and setting of circuit breaker values is displayed on a LCD display. 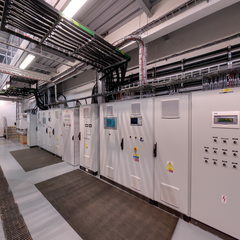 On the right are metal-enclosed compact MV switchboards, with a SF6 gas insulation system. Switches in the switchboard are remote controlled and fitted with an ABB control and protection system. A space for placement of a distribution transformer with capacity 400 kVA, 35 / 0.4 kV. Remotely controlled circuit breakers and load break switches are installed in six LV street cabinet between two MV/LV substations, replacing the fuses used standardly. The new protective elements are used to make the LV network fully automated. In the upper part of the LV street cabinet, the communication and control equipment (RTU, Wi-MAX antenna) and their back-up power supply are located. In the lower part there are circuit breakers, load break switches, fuses and a display showing the current values of settings of circuit breakers and load break switches. Within the E/MOBILITA project charging stations for normal charging and one station for fast charging are installed in Vrchlabí. The main task within the implementation is to assess the impact of charging on the power quality in the distribution network. Each station for normal charging is equipped with two separate sockets. One of them is equipped with standard Mennekes with charging parameters 32 A / 400 V, the other with a standard "domestic" socket with parameters 16 A / 230 V.
The station for normal charging at T. G. Masaryk Square was put into operation in September 2012 and Vrchlabí thus became the sixth city in the Czech Republic, where the E/MOBILITA CEZ Group extended the network of charging stations. The second identical station is installed in the underground garages under the T. G. Masaryk Square. 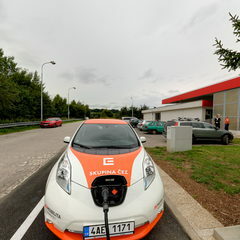 The customers who wish to use the services of both types of the CEZ Group charging stations, need to enter into a customer contract for Elektromobilita service with CEZ Group. This will give them chance of unlimited charging at all ČEZ stations for a symbolic flat rate. This charge amounts to CZK 150 (EUR 5.5) per month exclusive of VAT. To give you an idea, one full charging of a Nissan LEAF car costs about CZK 80 – 110 (depending on the tariff). That means that a monthly tariff amounts to about 2-3times charging of an electromobile in a given month. Further electricity consumption at the stations is free of charge. CEZ Group invoices the tariff in advance, always for the whole upcoming quarter. The CEZ Group has also started a new web portal Elektromobilita.cz which presents an updated map with details about charging stations (exact address of the location of a station and information about which station is currently free or occupied). The website also describes in detail the procedure to become the Elektromobilita CEZ Group customer. Since 1 July 2013 CEZ Group has been offering a new distribution rate customized for owners of electromobiles. It is designed for households (tariffD27d), but also for entrepreneurs and small businesses(tariff C27d). The ownership or long-term active use of an electric car is required. The product eTARIF FIX is designed for owners of electromobiles. This tariff provides the use of a low electricity supply tariff for overnight charging at home, for a continuous period of 8 hours. See the Elektromobilita site for more details. Within the E/MOBILITA project charging stations for normal charging and one station for fast charging are installed in Vrchlabí. The main task within the implementation is to assess the impact of charging on thepower quality in the distribution network. 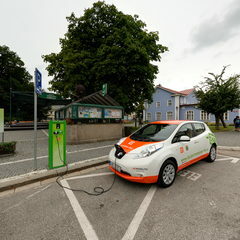 The operation of a fast charging station in Valteřická street in Vrchlabí started on 17 July 2014. The station at the Benzina petrol station is designed for fast charging. It is equipped with DC connectors operating on CHAdeMO and CCS charging standards which allow for a charging process with output up to 50 kW. Also AC charging is available with a standard Mennekes connector (socket) which allows for a charging process with output up to 22 kW. With this AC charging standard, the process of charging takes 1-3 hours. The DC charging with 50 kW capacity is much faster and enables charging of 80% of the accumulator capacity in 20 to 30 minutes. Input voltage is 400 V AC, 50 Hz. Output voltage 400 V AC (Mennekes) / to 500 V DC (CHAdeMO and CCS), output current 0-125 A DC depending on the type of a charged vehicle and the phase of charging (i.e. current state of battery recharging – the recharging current decreases with the increasing battery charge). Modernization of the distribution network consistent with the new requirements of customers as well as power generators. Two-way communication between the distribution network and customers. 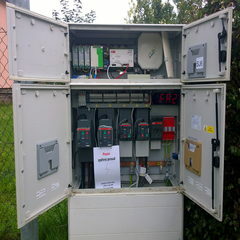 Monitoring of the actual power consumption using smart meters. Testing of unique, i.e. multi-utility measurement of household consumptions. Optimization of consumption management using smart meters. Smartmeters provide customers with running values of energy consumption. In combination with the planned wider range of energy tariffs this will mean that customers will be able to better plan their individual consumption. There is a consumption monitoring system, for residents and building managers of the building where multiutility measurement is implemented, it contains a simple overview of consumption of hot and cold water, gas and electricity. They can set filters on high and low consumptions per month, which easily identifies any error, such as malfunctioning meter or broken appliances. Download a booklet on the consumption monitoring system.